(CBS News) New parents with dogs and cats sometimes consider giving pets away when a baby arrives, but a new study finds keeping the furry family members in tow may boost a child's health benefits. A Finnish study finds babies who grow up with pets - especially dogs - are less likely to develop colds and other respiratory infections by the time they're toddlers. The study, published online July 9 in Pediatrics, tracked 397 kids in Finland from before they were born until they turned 1-year-old. Weekly questionnaires were given to parents that asked about their child's health and whether they owned a pet. The researchers determined that 245 of the babies had a dog in the home (62 percent) and 136 babies (34 percent) had cat contact. By study's end, 65 percent of children lived in homes without a dog and almost 76 percent lived in a cat-free home, so not everyone with a pet had it throughout the entire study. While respiratory infections and symptoms such as colds and wheezing are common in infants, an analysis revealed that babies who had early contact with dogs or cats were significantly healthier during the study and were 30 percent less likely to experience coughs, ear infections and symptoms such as stuffiness, runny nose, sneezing and congestion (rhinitis). Babies born in homes with dogs were also 44 percent less likely to develop another common ailment in kids: ear infections. Kids with dogs were also 29 percent less likely to have used antibiotics in the past year than children without pets. 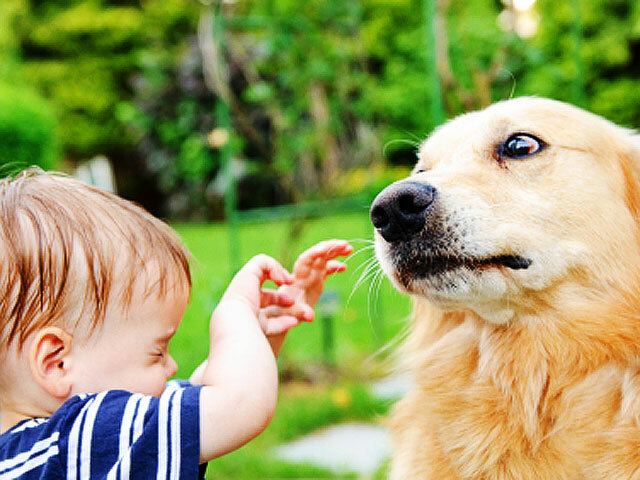 More contact with the dog was associated with fewer health problems in general, which led the researchers to believe that early contact with an animal may mature the immune system in infancy, helping toddlers better ward off disease. Owning a cat was also tied to protective health benefits, but the effect was much weaker. "Our findings support the theory that during the first year of life, animal contacts are important, possibly leading to better resistance to infectious respiratory illnesses during childhood," wrote the authors, led by Dr. Eija Bergroth, a pediatrician at Kuopio University Hospital in Finland. The strongest benefits were seen in children who had a dog inside at home for six hours a day or fewer, rather than at home all day, which might suggest what dogs track in may help boost early immunity. "It might have something to do with dirt brought inside by the dogs, especially since the strongest protective effect was seen with children living in houses where dogs spent a lot of time outside," Bergroth told WebMD. Should all prospective parents run out and get a dog? "I think the development of the immune system is very complicated," Dr. Jennifer Appleyard, chief of allergy and immunology at St. John Hospital and Medical Center, in Detroit, told HealthDay. "Parents shouldn't feel guilty about having or not having a pet when their child is young. If you want a pet, get a pet," she said. What's more, bringing a pet in the home in the hopes of curing a child with severe or allergies or asthma may not have the intended effect. "The absolute wrong thing is to put a dog in the house for kids with asthma," Dr. Karen DeMuth, assistant professor of pediatrics at Atlanta's Emory University, told WebMD. "Yes, having a dog in the house early can protect against wheezing or respiratory infections. But this exposure has to happen very early in life."